90 Madeira Thread 5,000mts Cones (6 Black, 6 white, 78 Colors), 1 Dressmakers shears 8”, 1 Squeeze snips scissors 4.5” Curved point, 1 Large Seam ripper, 1 Madeira 6” plastic ruler, 1 Tweezers (6” Bent), 1 box of 100 Madeira Needles ball PT large eye # 75/11, 1 box of 100 Madeira Needles Sharp large eye # 80/12, Sample of Madeira Needle LG Eye BP 65/9, Madeira sided Bobbin L Thread Box x 144 126 yd (Poly Filament), 1 Roll of 23” x 100yd white E-ZEE Tear 1.5 oz, 1 Roll of 24” x 100yd white E-ZEE Cut just right 3.0 oz, 250/pk of 41/2”x7” White E-ZEE Cap 2.5 oz, 1 Roll of 10”x 100yd E-ZEE Aqua 3ml just right, 1 Needle nose pen oiler, 1 Madeira Catalog, 1 E-ZEE Backing & topping sample guide, 1 polyneon Color card, 1 Frosted Matt Sample, 1 Polyneon # 60 Sample. Wilcom OEM Embroidery Studio Digitizing E3 includes all the digitizing tools possible and is only offered as a bundle with an embroidery machine purchase. Is very similar to the Embroidery Studio Designing E3 but doesn’t include Corel Draw graphics suite integration. This machine requires a loading dock or a fork lift. Standard shipping varies between 7 to 12 business days. Special shipping applies for residential or guaranteed date shipping. For other services and international shipping please contact our offices. 06 Heads Professional Embroidery Machine. This model is ideal for businesses whose focus is in high production and needs continuous production. Not only perform on conventional flat surfaces (fabrics, towels, blankets and unassembled clothing pieces) you can also embroider beautiful designs in hats, t-shirts, jackets and other garments. Works 24 hours a day!. Schedule a Virtual or In-Person Demo. One on One On-Site All Inclusive 2 Days Installation and Training (Price $ 2,199.00). 3000VA Voltage Regulator (Store Price 180.00). 12 NEEDLES OR COLORS (Upgrade to 15 Needles Available). TOUCH SCREEN HD LCD 10" Dahao Control Panel - Humanized design for perfect operation experience. 100 MILLION STITCHES of memory capacity. INSTANT PUNCH Ideal for embroidery names, letters, numbers or words. Just typing from the LCD panel, choose the size and font, add some special effect and be ready for embroidery quickly and with excellent definition. THE PATTERN REPEATS CYCLICALLY Embroiders without stopping, makes multiple repetitions in X and Y using all orderly spaces, ideal for emblems, coats and pants pockets. DESIGN EDITION ON PANEL Availability to edit, combine, and separate designs on the control panel. DESIGN PREVIEW Before embroidering a new design for the first time you can perform a motion test of the embroidery process without a stitch being made. This helps to verify that the design will be embroidered in the desired location of the garment, as well as to verify that the design is not too large for the selected hoop or frame. This not only avoids ruining valuable garments, materials or loss of time but also ensures that there is proper clearance between the hoop, needles and frame arm to avoid collision and damage. PANASONIC SERVO MOTOR Accelerate and de-accelerate quickly. FREE Maintenance. STANDARD USB PORT Keeping up with the standards of the computer industry. 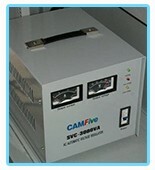 Our CAMFive accepts USB Flash Memory. (Wireless Options Available). MECHANICAL PARTS MANUFACTURED WITH "CNC" Our CAMFive machines have been built with our industrial-grade system and built under our CNC (Computerized Numerical Control) standards & tolerances, using strict manufacturing processes that guarantee maximum stability and minimum wear and tear of its components throughout its lifetime. PANTOGRAPH OR SASH FRAME FOR FLAT EMBROIDERY A Pantograph is included to embroider large designs or produce many small patches. This will help you save time and material. 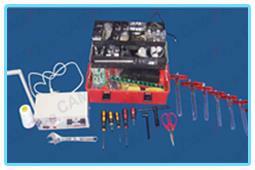 TOOLS BOX, BASIC SPARE PARTS Y THREAD WINDER A complete tool kit is provided to perform preventive maintenance. This kit also includes spare parts, bobbin winder. ANTI-STATIC "PEPERLINE" thread tension bases with tubes. SAFETY DEVICES ( EMERGENCY BUTTON AND SECURITY SENSORS ) Electronic break detection is implemented on top and bottom thread, it has an emergency stop button, area limit sensors, position, and more. CAMFive embroidery machines maintain high standards and production quality, coming equipped with an effective safety system which is one of the best in the industry. Our equipment complies with ISO security norms and codes. MANUALS AND INSTRUCTIONAL VIDEOS An Installation, Operation, and Maintenance Manuals and instructional videos that contains clear explanations of the Installation process and the usage of the software, the control panel and other features. (For machines only). Machine Dimensions Wide: 138" (3.50 mts), Deep: 63" (1.60 mts), High: 71" (1.80 mts). Dimensions are included an installed worktable and thread castle. Square Back Hoops (For Jackets) 12 ( 11.81" x 11.81"). Cap Frame's driver 6 (270° Wide Angle). Save time with our CAMFive embroidery machine. Everything at your fingertips. You can input designs in lots or groups, delete unnecessary files, modify existing files in memory, and edit them. Everything while is working! Supports industry standard .dsb, .dst, .dsz file formats. Internal memory: the standard memory stores up 100,000,000 stitches or 10,000.00 designs (may be upgraded upon request). The pattern repeats cyclically: Embroiders without stopping makes multiple repetitions in X and Y using all orderly spaces, ideal for emblems, coats and pants pockets. Thicker/thinner line compensator in the panel: You can enlarge or reduce design lines without distorting the image from the control panel; this is a huge time saver. Design Edition on Panel: Availability to edit, combine, and separate designs on the control panel. Design Preview: Before embroidering a new design for the first time you can perform a motion test of the embroidery process without a stitch being made. This helps to verify that the design will be embroidered in the desired location of the garment, as well as to verify that the design is not too large for the selected hoop or frame. This not only avoids ruining valuable garments, materials or loss of time but also ensures that there is proper clearance between the hoop, needles and frame arm to avoid collision and damage. Forward and reverse stitch with adjustable speed: This important process is made grade by grade at high speed, retakes the embroidery quickly and precisely. Automatic Memory Recovery SystemIn the event of a power loss or failure in the middle of an embroidery process, the system recovers and recognized wherein the embroidery design the failure occurred, the system then picks up in the exact spot and resumes the embroidery work where it was left off. Password anti data theft: Does not allow an unauthorized person to access the files. Electronic Monitoring System analysis: multiple sensors allow the machine to detect that all its components are working correctly, through a very simple scanning process. 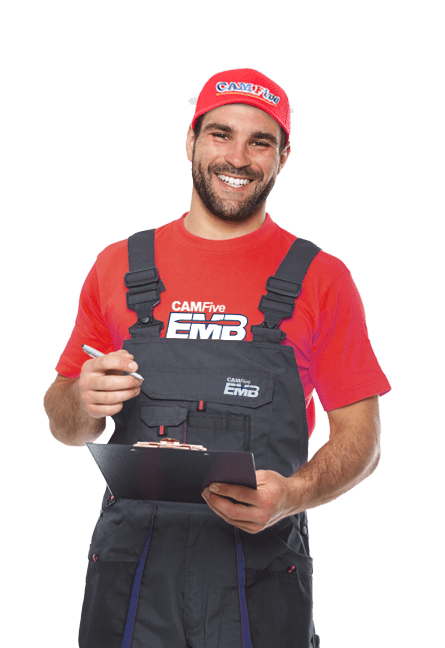 Our CAMFive machines have been built with our industrial-grade system and built under our CNC (Computerized Numerical Control) standards & tolerances, using strict manufacturing processes that guarantee maximum stability and minimum wear and tear of its components throughout its lifetime. Our thread tension controllers, besides achieving perfect harmony, have tubes that travel between the cones tower and the tension bases. These are an enormous aid in reducing snarling and tangling which generally are produced by the twisting of the metallic thread. Programmable and highly accurate, this feature automatically cuts the tread before and after a color change. The height can be adjusted and calibrated from the control panel. Includes a programmable thread collector which is automatically activated each time the machine cuts a thread. The break-detection sensor stops the embroidery process and gives an indication in the event of upper or lower thread break. Our "High Speed" series manages to develop the 1,000 spm speed and gain greater definition per stitch each time because it is equipped with servo movement motors; these are electronically controlled and allow smooth and quick movements. Our machines also come with Japanese made “ROTARY HOOK”, either the Koban or Hirose brands. Electronic break detection is implemented on top and bottom thread, it has an emergency stop button, area limit sensors, position, and more. CAMFive embroidery machines maintain high standards and production quality, coming equipped with an effective safety system which is one of the best in the industry. Our equipment complies with ISO security norms and codes. A Pantograph is included to embroider large designs or produce many small patches. This will help you save time and material. Please consult your sales representative. A complete set of frames, hoops and a cap kit are also included with your machine. The kit comes as a double set to maintain continuous production. To make sure your equipment never stops running, in the unlikely event that your equipment needs technical service, we have an extensive inventory of spares parts as well as technical support at any of our two fully stocked facilities in Los Angeles, CA and the other one in Orlando, FL. 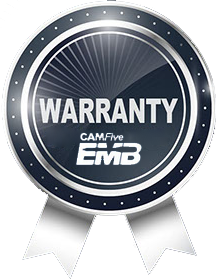 CAMFive also offers a comprehensive warranty policy for manufacture defects. Keeping up with the standards of the computer industry, our CAMFive accept USB Flash Memory. All of our industrial embroidery machines can be equipment with a “Single” sequin attachment (one sequin roll on each head) you can also special order a “Double” sequin attachment (Two different rolls on each head). You would be able to embroider and add sequin at the same time. This accessory can be installed on our embroidery machines. It holds and an incredible variety of cords and ribbons to be included in your designs or have them work independently. (Please ask your sales representative). All of our embroidery machines of bridge series are capable to support a chenille system, available to be installed at the CAMFive factory. (Confirm if available in your country). 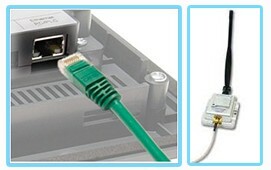 We're including an RJ45 Ethernet network port to control the machine from another location via optional software. 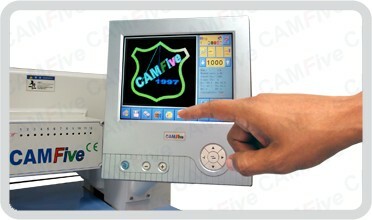 Ideal for large factories and centers of high production or for remote control of what happens in the machine, load designs, delete, modify, parameterize your embroidery machine, embroidering and seeing everything remotely, and you can access various CAMFive online to prepare the work without USB memory (Confirm if available in your country). In CAMFive EMB we exceed our compromise with our customers. Our most important goal is to full fill your expectations and needs. 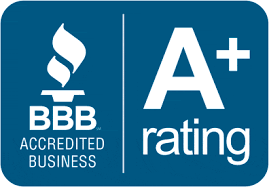 We provide outstanding customer service to satisfy our customer request. 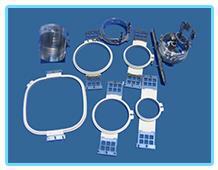 Complete inventory of spare parts for all the embroidery machine models.